Republicans in the State Senate say that, despite the over, $4 billion dollar structural deficit, taxes need to be cut further and a property tax cap must be made permanent. Senate GOP Majority Leader John Flanagan says the state needs to cut income taxes, property taxes and energy taxes, in the midst of a brutally cold winter. And he says some tax cuts for middle-class New Yorkers that begin to take effect this year need to be speeded up. “We actually want to accelerate the tax cuts,” Flanagan said. Senate Finance Committee Chair Cathy Young says even though there’s a multi-billion dollar budget deficit, and that “budget circumstances may be tough”, says the GOP will resist any potential efforts by Democrats to roll back the middle-class tax cuts that are to be phased in over the next several years. “We will not consider any attempt to suspend, roll back or delay the next phase of the tax cut,” said Young. The Senate, immediately after the announcement, passed a one house bill to make permanent a cap on state property taxes. The cap limits property tax levy growth to 2% a year or the rate of inflation, whichever is less. Democrats, meanwhile, have said they might support tax increases, in some cases, to close the deficit and deal with potentially billions more in cuts from the federal government. Governor Cuomo hinted in his State of the State speech on January 3rd that he might back tax hikes on people he says will benefit the most from the recent federal tax overhaul, which includes cuts to corporations and some wealthy taxpayers. And Democratic Assembly Speaker Carl Heastie says he’d back tax hikes in some cases if they are fair and help to close the deficit. Senate Leader Flanagan was hazy on details of how to pay for additional tax cuts that Republicans are proposing. He says he believes the problem could in part take care of itself if the tax cuts create jobs and stimulate the economy. 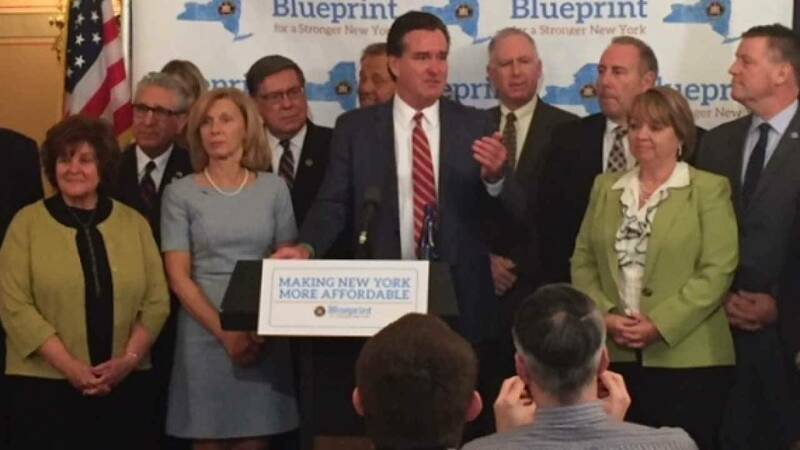 “I know it’s a novel concept in Albany, but we want to create jobs,” said Flanagan. Flanagan did not directly answer a question on whether he’d advocate for any spending cuts. But he predicts that the continued Wall Street boom, and the increased tax revenues that brings to the state, could allow the governor and legislature to continue “investment” in the two biggest parts of the budget, education, and healthcare. In recent years, there have been record increases in spending on schools. Last year an additional billion dollars was given to the school districts. State Comptroller Tom DiNapoli, speaking at a forum on the budget at the Albany Times Union, Hearst Media Center Tuesday, says one of the reasons that the state’s property tax cap, approved in 2011, has worked, is because the state has provided enough aid to hold the line on local taxes. He says if school aid is flat, or reduced, schools could be squeezed. “You’re going to see tremendous complications,” said DiNapoli. Another complicating factor for schools budgets, and the state budget is the new federal tax law that results in the limits on deductions for state and local taxes, including school property taxes. Governor Cuomo is expected to say how he would deal with the budget gap and the federal policy changes, on January 16th, when he unveils his budget plan.